Go Global visits many college campuses all over the country during recruiting season, and we have students come abroad with us from even more universities than we are able to visit. We do speak at chapter meetings at Greek organizations when we visit campuses because it’s a great way for us to reach a large audience in one room. However, so many of our students are not Greek, and we never want a student to shy away from applying for our program just because they may know a Greek going on the trip, too. We accept a diverse population of students, and this is something we are very proud of and excited about each year. Community Leader and LEAD Cape Town 2014 student Emily Hauben is a perfect example of an unaffiliated student coming abroad with us. Read here to check out her guest post about what it was like to not be Greek on her Go Global trip and why she had such a positive, uplifting experience. “When I arrived in Dulles to meet the group flight to Cape Town, I sat in a chair in front of the sign for South Africa Airways and waited. Over the next few hours, a herd of people my age arrived and began to gather in groups and engage in the small talk of typical apprehensive but adrenaline-fueled college students. I started to notice a pattern – letters, everywhere. Up until that moment, I hadn’t considered how heavily Greek Go Global trips are, as they hadn’t recruited at my school, the University of Virginia. Initially, the nerves I had about the trip escalated. I was the only student from UVa., I was from New York, I only knew one other person coming to Africa with me, and I was unaffiliated. Girl #1: Hey, so nice to meet you, I’m ___________. Where are you from? Me: I’m from New York, what about you? Girl #1: That’s so cool! My family was just there for a trip around Christmastime. I love the city. I’m from Georgia, but I go to Alabama. Me: Oh cool, I don’t really know anyone at Bama. I go to UVa. Girl #1: Do you know “so and so,” she’s a Kappa? Me: I think I’ve heard of her, maybe. I’m not Greek, but a lot of my friends are. It’s a pretty big school. There’s nothing wrong with having a conversation about friends you know at a given school and your Greek affiliations, but through Go Global I’ve learned that it’s not necessarily the best way to get to know with people. Greek life is an incredible way to make initial connections with new people, if you’re a part of it. However, if you’re not it should not at all deter you from wanting to study abroad. During one of the first classes in Cape Town, Joanna stood up in the front of the room and said something that really changed my perspective on small talk. She said “on Global LEAD we’re going to teach you how to have real conversations.” She challenged us to get to know each other at a deeper level than where we go to school and where we’re from. Those details don’t define a person’s character, and that’s what really matters when you’re genuinely trying to connect with someone. We learned to ask strangers about their ambitions, fears, favorite foods, and dearest memories. It was in these candid, awkward conversations where I made friends that I will never forget. Go Global taught me to get to the heart of someone’s personality, and skip past all the other courtesies we are accustomed to asking. Despite the fact that my t-shirts weren’t marked with Greek letters, I met incredibly people with whom I shared a wide variety of interests. Yesterday, Hannah Gibson, one of my closest friends from Cape Town commented on post on Go Global’s Instagram account and tagged a group of our friends from the trip in it. It was a Jamie Tworkowski quote stating what you’ll need when studying abroad: “You’ll need coffee shops and sunsets and road trips. Airplanes and passports and new songs and old songs, but people more than anything else. You will need other people, and you will need to be that other person to someone else, a living, breathing, screaming invitation to believe better things.” This message reminded me that regardless of the inconsequential differences between the friends I made abroad, we shared experiences that will bond us eternally. We held hands before jumping off bungee bridges, cried and hugged when we left Sir Lowry’s Pass for the last time, and laughed at each other’s stupid jokes all along the way as we explored an unknown city. 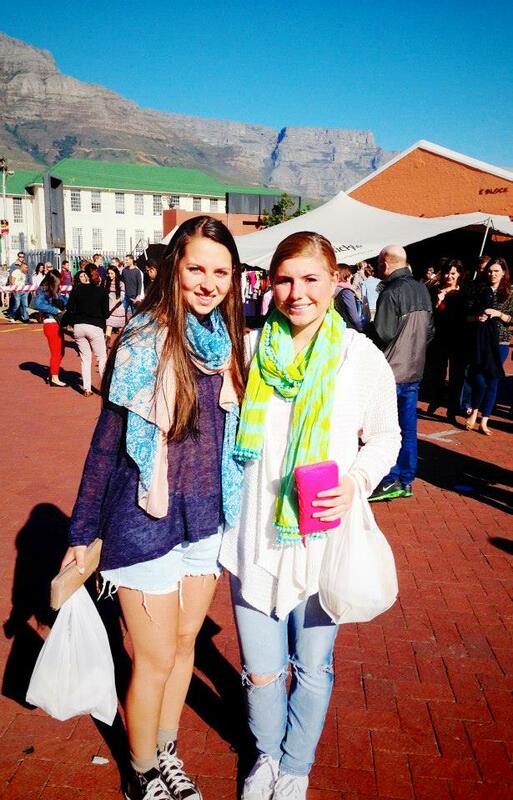 EMILY AND HANNAH ENJOYING A SATURDAY AT OLD BISCUIT MILL! So, those of you who aren’t Greek, what do you say? Are you ready for an eye-opening experience that entirely changes the way you converse with others and the way others converse with you? You’re sure to meet amazing friends from all types of organizations all over the country. Just take the leap of faith.